These are some of the findings of a new poll commissioned by the Corporate Reform Coalition, of which Demos is a part. 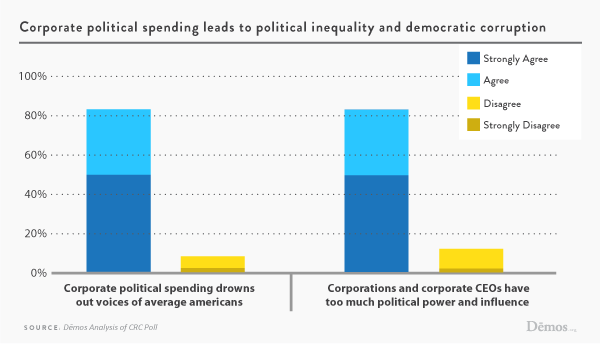 The survey explored Americans’ attitudes toward corporate political spending and found that they believe that it drowns out the voices of average Americans and corrupts our democratic government. It also found overwhelming support for strong, common sense reforms to ensure transparency and accountability for corporate political spending, should it occur, and for systemic solutions to the problem of the role of money in politics. Corporations are established through state law and, as such, should not be beyond democratic accountability.12 As the Supreme Court noted before its recent sharp turn towards campaign finance deregulation, corporations “receive from the State the special benefits conferred by the corporate structure and present the potential for distorting the political process.”13 When corporations are given a First Amendment right to flood the airwaves with their messages, they can overpower the voices of other citizens whose constitutional right to political speech deserves no less protection than those with greater financial resources. This undermines the political equality that gives our democratic government legitimacy. 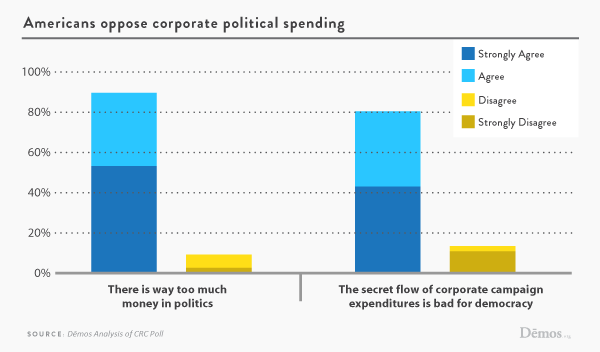 Americans clearly understand that corporations spend money on politics in order to extract their own benefits from government. Economists deride the process of rent seeking, whereby one company seeks advantage over another not through economic competition in a free marketplace on the strengths of their goods and services, but by advantaging themselves through non-competitive means. Americans understand this dynamic. More than 7 out of 10 (72%) agree that corporations spend money on politics to gain an economic advantage over their competitors, and over 38 percent strongly agree.17 But what can be good for one company can be rotten for the market as a whole - not to mention the public. The American people can see the reality of the corrupting influence of money in politics with greater acumen than the Supreme Court. 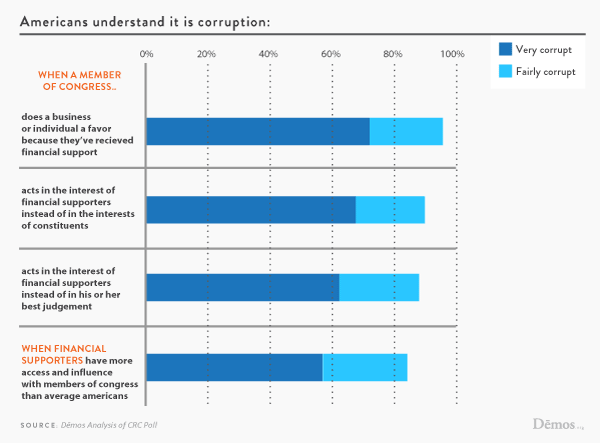 Eighty-five percent of Americans call it corruption when financial supporters have more access and influence with members of Congress than average Americans – 57 percent say this is very corrupt. Americans believe that government is corrupted when a member of Congress does a business or individual a favor because they received financial support (90%), acts in the interests of financial supporters instead of in the interests of constituents (89%), or acts in the interests of financial supporters instead of in his or her best judgment (87%). Americans agree with these statements by margins of almost or just over 80%. Yet already a huge majority of Americans are worried about special interests buying elections and about the corruption of our democratic government. Forty one percent of Americans worry very often about the corruption of government, another 21 percent worry fairly often, and 24 percent worry about it occasionally. Taken together, 86 percent of Americans are worried about corruption of our government. Eighty two percent of Americans are very often, fairly often, or occasionally worried about special interests buying elections. The same percentage of Americans are very or fairly often worried about the corruption of government (62%) as they are worried by special interests buying elections (62%). This state of affairs cries out for reform before unaccountable corporate money in our elections becomes the new normal. In a case overruled by Citizens United, the Court decried “the corrosive and distorting effects of immense aggregations of wealth that are accumulated with the help of the corporate form and that have little or no correlation to the public’s support for the corporation’s political ideas.”24 Unfortunately, short of a constitutional amendment or a return to the Supreme Court’s earlier understanding of the dynamics of money in politics and the duty of government to protect the democratic sphere, current options are limited. But there are several strong, achievable reforms that would temper the democratic distortion and corrosion that we face. In Citizens United, Justice Kennedy emphasized the importance of disclosure and accountability for corporate political spending. He wrote that disclosure requirements “provide shareholders and citizens with the information needed to hold corporations and elected officials accountable for their positions and supporters.”28 But those who seek to protect secret corporate political spending try to portray efforts to hold corporations accountable for their forays into elections as an attempt at harassment in order to evade disclosure. Voters have the right to know who is seeking to influence their vote and the decisions of their elected representatives. The public needs the information to be able to decide what weight to give the speech, and to be able to make connections should financial support engender access and influence leading to corrupt governance later. Indeed, in Citizens United the Justices held by a vote of 8 to 1 that mandatory disclosure is constitutionally sound because it “enables the electorate to make informed decisions and give proper weight to different speakers and messages.”30 Unfortunately, corporate funds are frequently funneled through third party groups such as the U.S. Chamber of Commerce, which refuse to disclose the underlying donors who provide the financial resources for their political activities. Third Party Disclosure: Over three-quarters of Americans (77%) favor a specific requirement that companies must publicly disclose their political expenditures to groups that spend money on politics like the Chamber of Commerce; 45 percent are very strongly in favor of this measure.31 Only 17 percent oppose this measure, which means the margin of Americans in favor of getting rid of dark corporate money is almost 60 points. Small Donor Public Financing: Three-quarters of Americans (74%) favor a plan where candidates could run for Congress without raising large contributions because candidates would collect small contributions and receive limited public funds.32 Americans favor such a system by a margin of 56 percent - only 18 percent oppose it while over 38 percent are strongly in favor. Seven out of 10 Americans (72%) believe that politics would improve with public funding of Congressional campaigns instead of special interest spending. 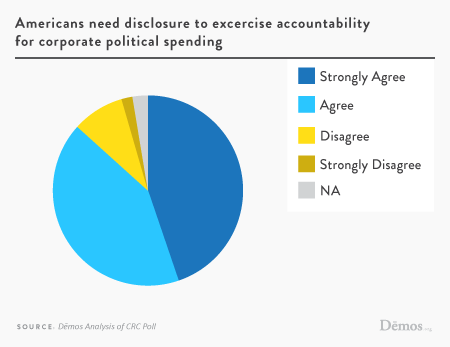 Disclosure and Disclaimer: Almost three in four Americans (74%) favor a requirement that the name of the company and its CEO must appear in ads paid for by corporate political money, and 45 percent strongly favor that requirement.33 Only 21 percent oppose it. By a margin of 53 points Americans believe that the name of the company and its CEO must appear in ads paid for by corporate political money. Shareholder Approval: Seven out of 10 Americans (71%) favor a requirement that shareholders in a company approve all corporate political spending before the money is spent.34 Forty percent strongly favor that measure, and only 23 percent oppose it. Americans approve of this measure by a margin of 48 points. Finally, the Corporate Reform Coalition poll shows that Americans are ready to act to prevent their voices from being drowned out by corporate political spending. Seventy nine percent would refuse to buy a company’s product or services to protest a company’s political spending. Seventy five percent would sign a petition to the SEC for corporate disclosure. Two out of three people (65%) would sell stock in the company, and over half (53%) would ask their employer to remove it from their retirement account. Just over half of respondents (52%) would go to a meeting of the company’s shareholders to ask for disclosure; 44 percent would be willing to go to protest. Americans understand that it is a corruption of the principle of a government “of the people, for the people, by the people” when moneyed interests are able to spend their way to greater access and influence with elected representatives, and when elected representatives are beholden to their financial supporters. Fidelity to the principle of political equality is the difference between a vital democracy and a stultifying plutocracy. Transparency and accountability reforms may temper some of the most corrosive and distorting effects of corporate wealth massing in our political system, but systemic changes are also necessary. The public is firmly and strongly in support of these measures. The time is now for fundamental reform of the role that money plays in our government, particularly when it comes in the form of corporate political spending. 94% of Democrats, 82% of Republicans, and 91% of Independents surveyed agree that there is way too much corporate money in politics, as do 97% of liberals, 81% of conservatives, and 93% of moderates surveyed. 88 % of Democrats, 76% of Republicans, and 80% of Independents surveyed agree that the secret flow of corporate campaign expenditures is bad for democracy, as did 90% of liberals, 75% of conservatives, and 83% of moderates surveyed. 76% of Democrats, 66% of Republicans, and 69% of Independents surveyed agree, as did 77% of liberals, 63% of conservatives, and 73% of moderates surveyed agreed. 56% of Democrats, 44% of Republicans, and 57% of Independents surveyed favor a constitutional amendment to ban all corporate political spending, as do 63% of liberals, 42% of conservatives, and 57% of moderates surveyed. 91% of Democrats, 77% of Republicans, and 84% of Independents surveyed agree that corporate political spending drowns out the voices of average Americans, as do 93% of liberals, 78% of conservatives, and 84% of moderates surveyed. 94% of Democrats, 74% of Republicans, and 85% of Independents surveyed agree that corporations and corporate CEOs have too much political power and influence, as do 94% of liberals, 75% of conservatives, and 89% of moderates surveyed. 89% of Democrats, 77% of Republicans, and 82% of Independents surveyed agreed that corporate political spending has made federal politics more negative, as do 88% of liberals, 77% of conservatives, and 86% of moderates surveyed. 89% of Democrats, 80% of Republicans, and 84% of Independents surveyed agree that corporate political spending makes Congress more corrupt, and 90% of liberals, 78% of conservatives, and 87% of moderates surveyed agree. 88% of Democrats, 73% of Republicans, and 78% of Independents surveyed agree that corporate political spending makes state politics more negative, and 89% of liberals, 73% of conservatives, and 82% of moderates surveyed agree. 84% of Democrats, 72% of Republicans, and 78% of Independents surveyed agree that corporate political spending makes state politics more corrupt, and 87% of liberals, 72% of conservatives, and 81% of moderates surveyed agree. Anthony Kammer, What Is a Corporation? Demos Explainer Series,October 23, 2012, available at http://www.demos.org/publication/what-is-a-corporation. Austin v. Michigan Chamber of Commerce, 494 U.S. 652, 661 (1990). 79% of Democrats, 70% of Republicans, and 74% of Independents surveyed agree that corporate political spending helps companies block new laws in Congress that would help consumers, and 83% of liberals, 65% of conservatives, and 80% of moderates surveyed agree. 81% of liberals, 72% of conservatives, and 82% of moderates surveyed agreed that corporations spend money on politics to influence legislation. 76% of liberals, 65% of conservatives, and 79% of moderates surveyed agreed that corporations spend money on politics for access to elected representatives. 71% of Democrats, 63% of Republicans, and 80% of Independents surveyed agreed that corporations spend money on politics to gain an economic advantage over their competitors, as did 78% of liberals, 64% of conservatives, and 76% of moderates. 73% of Democrats, 70% of Republicans, and 80% of Independents surveyed agreed that corporations spend money on politics to get government contracts, as did 81% of liberals, 66% of conservatives, and 76% of moderates surveyed. Citizens United v. Federal Election Com’n, 130 S. Ct. 876, 910 (2010). For a discussion of the lack of Super PAC independence, see Taylor Lincoln, Super Connected, Super PACs’ Devotion to Individual Candidates Undercuts Assumption in Citizens United That Outside Spending Would Be ‘Independent’” Public Citizen, October 24, 2012, available at http://www.citizen.org/documents/super-connected-candidate-super-pacs-not-independent-report.pdf. Nixon v. Shrink Missouri Government PAC, 528 U.S. 377, 389 (2000). McConnell v. FEC, 540 U.S. 93, 144 (2003) (quoting Nixon v. Shrink Missouri, 528 U.S. 377, 390 (2000)). Austin v. Michigan Chamber of Commerce, 494 U.S. at 660. 84% of Democrats, 78% of Republicans, and 77% of Independents surveyed agree that corporations should only spend money on political campaigns if they get approval from their shareholders first, as do 83% of liberals, 76% of conservatives, and 81% of moderates surveyed. 88% of Democrats, 77% of Republicans, and 80% of Independents surveyed agree that corporations should only spend money on political campaigns if they disclose their spending immediately, as do 91% of liberals, 75% of conservatives, and 82% of moderates surveyed. 92% of Democrats, 87% of Republicans, and 86% of Independents surveyed agree that prompt disclosure of political spending would help voters, customers, and shareholders hold companies accountable for political behavior, as do 92% of liberals, 83% of conservatives, and 88% of moderates surveyed. Citizens United v. FEC, 130 S. Ct. at 915-916. 83% of Democrats, 72% of Republicans, and 77% of Independents surveyed agree, as do 85% of liberals, 70% of conservatives, and 79% of moderates surveyed. 78% of Democrats, 70% of Republicans, and 77% of Independents surveyed agree as do 80% of liberals, 70% of conservatives, and 76% of moderates surveyed. 80% of Democrats, 67% of Republicans, and 74% of Independents surveyed agree, as do 86% of liberals, 63% of conservatives, and 78% of moderates surveyed. 73% of Democrats, 71% of Republicans, and 73% of Independents surveyed agree, as do 77% of liberals, 66% of conservatives, and 74% of moderates surveyed.